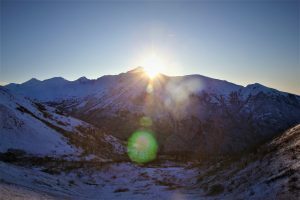 The Chugach Mountains behind Anchorage might be as familiar as your bedroom wall, but they’re still big, rugged peaks with plenty of hard miles in them. Our guests on the next Outdoor Explorer have done those miles. We’ll talk with mountain runners who have completed the 12-Peak Challenge, an incredible ultra-marathon that links a dozen summits in the front range on a single very long day. We’ll also hear some personal stories about the local trails we cherish so much. Segment 1: “12-Peak Chugach run”. JT Lindholm, local runner. Segment 2: “A coming of age story about hiking Crow Pass without parents”. Aubrey Smith – Trail Tales #6. Segment 3: “Chugach 12 peak run”. Harlow Robinson. Segment 4: “We are Mountain Runners”. Indie Alaska, Alaska Public Media. Segment 5: Tony talks about the origins of the Coastal Trail and the trail connections he continues to pursue. Tony Knowles – Trail Tales #5.